We all need to chill out. Sometimes things get so wound up. Sometimes, I realize that things that I started doing for fun are making me worry. Sometimes we get so caught up in the little things that aren’t working out, that we forget to appreciate the things that are. Worry: My poster colours didn’t print quite the way I wanted them to. What I should appreciate: I get to go to Boston to present this poster at an international conference. Worry: I didn’t bring my umbrella to work and got soaked walking home in the rain. What I should appreciate: It was rain, not snow. Worry: My husband won’t like his birthday present. Isn’t this just the silliest one? It’s a present, what’s not to like? 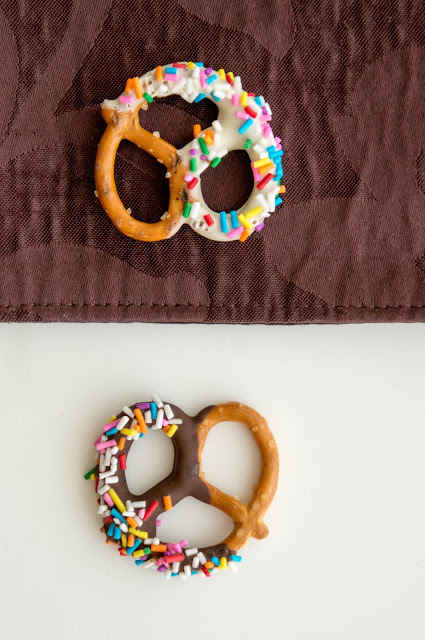 Worry: I don’t have any chocolate or sprinkles on my pretzels. Let’s fix that and stop worrying! 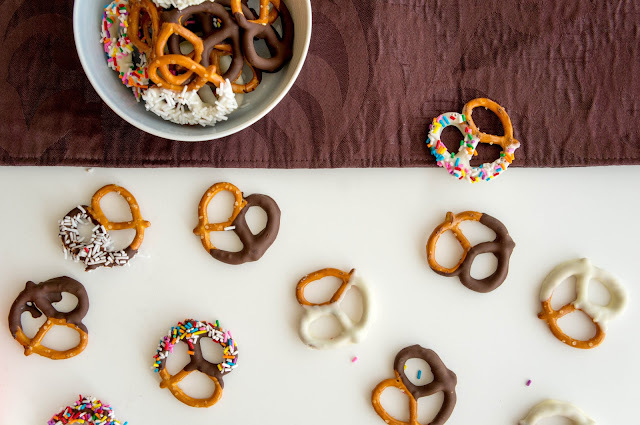 Pretzels are dipped in melted white, milk, or dark chocolate. Melty-chocolate pretzels are coated in sprinkles and set aside to dry. 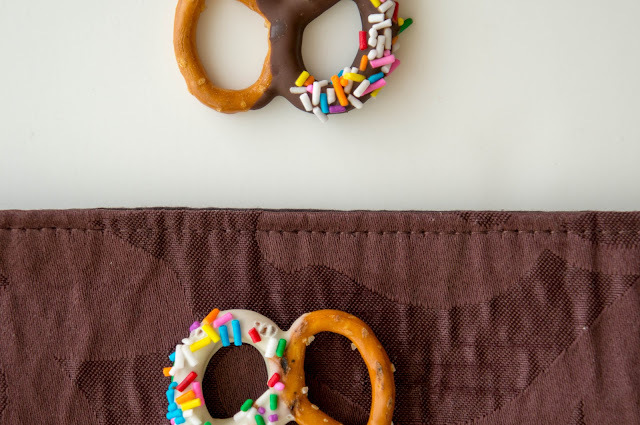 An alternative strategy is to dip the pretzels in the chocolate and immediately place inside your mouth. This sweet and salty combination is heaven! I just love rainbow sprinkles lately. I used them on this vanilla mousse, these cupcakes, and this Easter cake. They are so fun! No worries here, just delicious sweet and salty thoughts. Melt the chocolate over a double boiler or in short 30 second bursts in the microwave stirring in between until all melted and smooth. 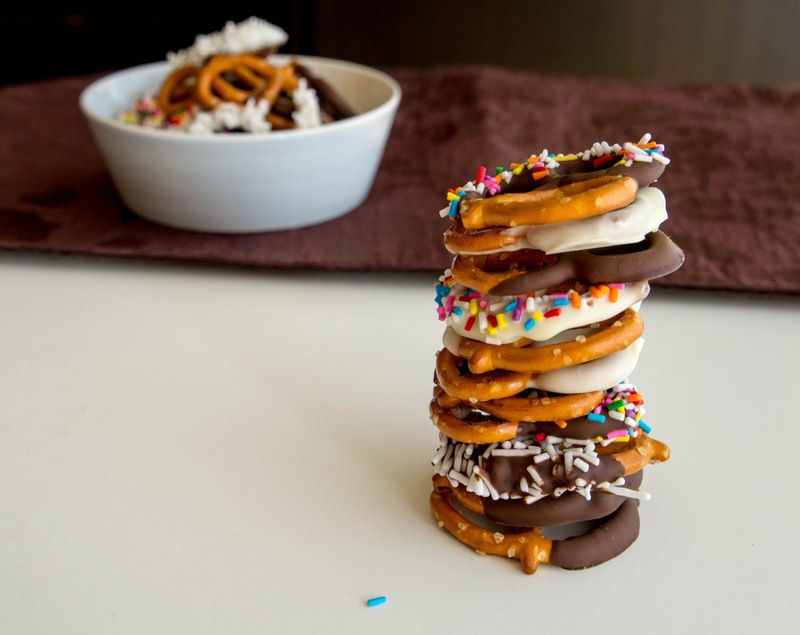 You want enough chocolate to be able to dip a pretzel. I like to put mine in a small, fairly deep bowl to maximize dipping efficiency. 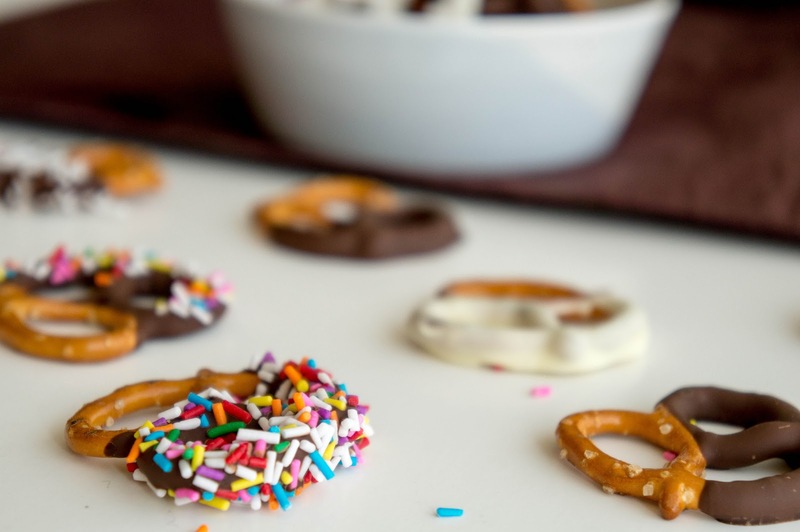 Also prepare your sprinkles in a small bowl. Prepare a pan with wax paper to place dipped pretzels. Dip your pretzels in chocolate, shaking off the excess, and then dunk into sprinkles (optional). 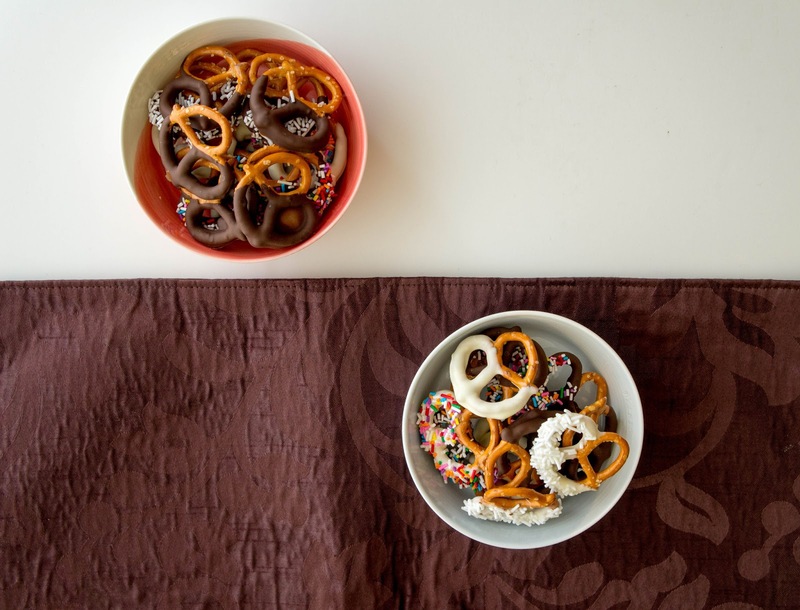 I like to make a variety of combos, but I think my fave was white chocolate and rainbow sprinkles. Place them on the wax paper to cool and harden. Make as many as you want! If you want these the harden faster you can put them in the freezer. Then store in an airtight container at room temperature.